I only entered the one garment into the Los Angeles County Fair this year. I paid to enter three things but I didn't get anything else done that I'd planned on. 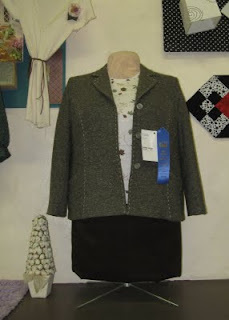 It was so exciting to visit the fair and find a blue ribbon on my jacket. You may remember the trials and tribulations, including 4 muslins that it took to get the jacket to fit just right. Then I added the embroidery thread around the edges to make the design lines pop. All the fabric used on the jacket was stashed materials. I really took my time with this jacket. It's nice when your work is recognized. I had some pretty steep competition too, so the blue ribbon means just that more to me. 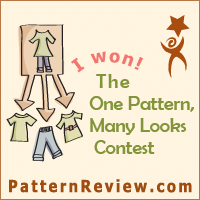 Congratulations to my friends and fellow sewists that entered and won a ribbon. I can't wait to go back and look at each and every item on display. That'll have to wait for a day when I can go by myself. I don't want anyone rushing me through when I need to study and admire each and every item. Then I can come back and copy all my favorites!